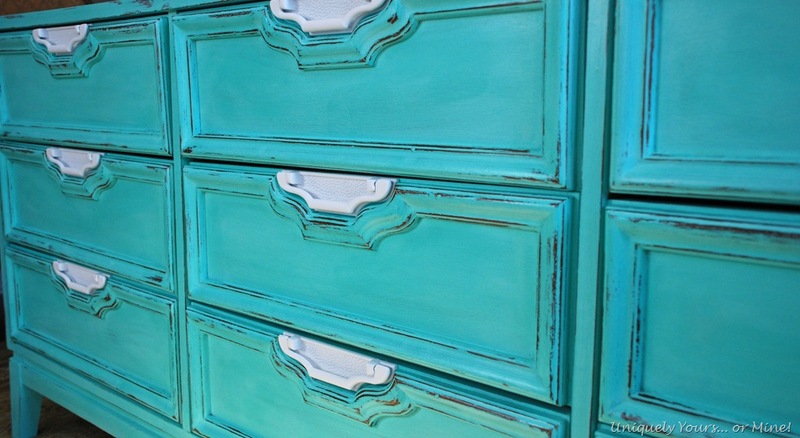 Beautiful Turquoise Dresser Update – Uniquely Yours… or Mine! 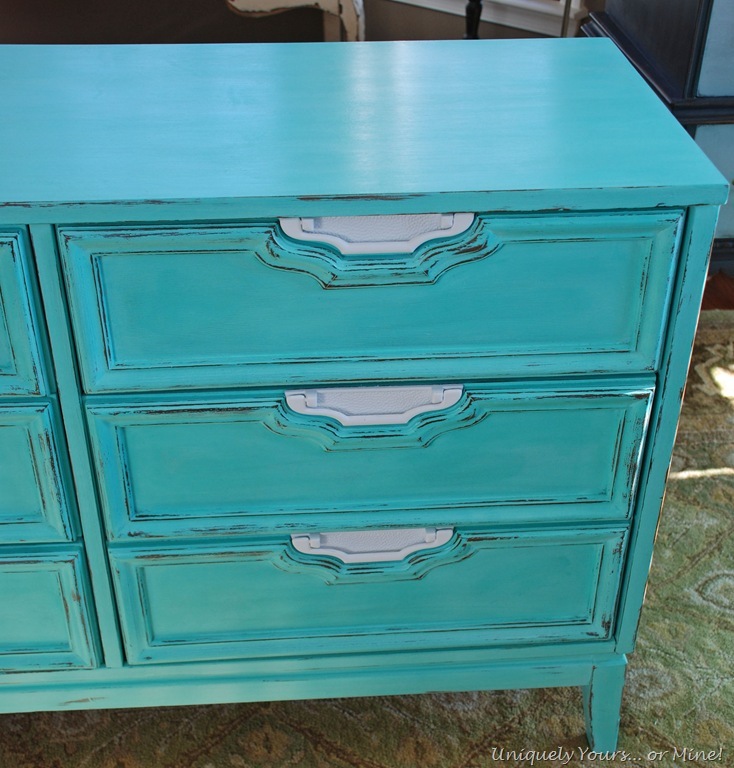 This dresser is not the style I would usually pick out, but I did and I am so glad of that now! The drawers were a little wobbly, the legs were loose and the top had some stains but other than that it was in very good shape! 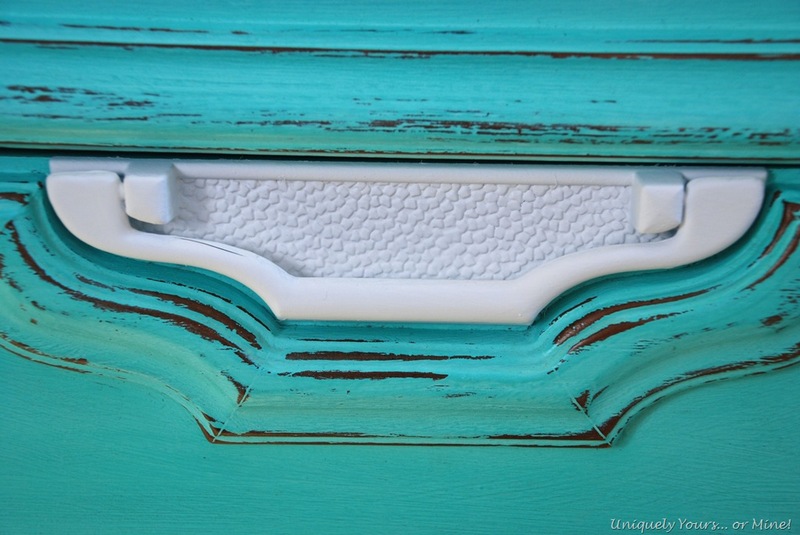 I love the way the handles are built into the drawers… no changing out these handles (not that I would)! I sprayed the handles in a flat white to really make them POP! The top is now smooth and lovely after a coat of clear wax and a nice buff with 0000 steel wool. I have this Queen sized headboard that we painted the same color, just in case someone wants a “set”. 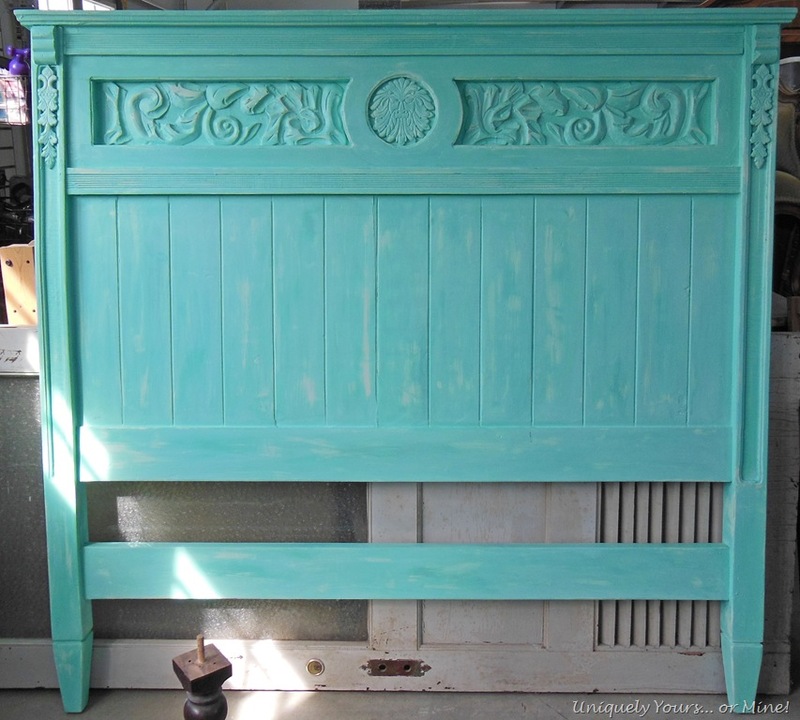 The headboard has lots of great details and is unique for sure! Wouldn’t they look great together?! Hope you like this piece, I’m sure someone will find just the right place for it! 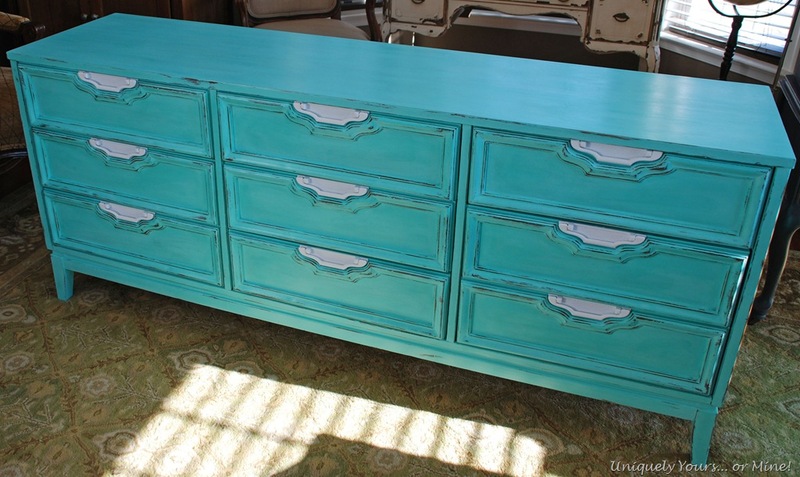 I would have never guessed that dresser could look so good! I know Deb! I almost didn’t buy it.. It wasn’t really my style, but I love the final results! and you nailed this transformation !!! Our dresser! 🙂 I LOVE the clean lines of it – You should def look for more pieces like this! I’m sooo glad you guys love the dresser! I think you’re right about looking for more pieces like this! This is absolutely gorgeous. The teal is the perfect color for this piece. Thanks so much Jennifer! It is a little cutie! Love the color! 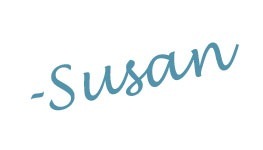 I have to do something in turquoise – but i don’t have much of it in my house that color. Guess I would have to sell it!! Great job – home you will visit me as well (I did a mini Swedish Clock makeover on My Romantic Home also…where i found you! You’re funny Linda! I have a lot of blues and greens, which I guess is why I paint a lot of those colors 🙂 thanks for stopping by! I don’t have anything in my house that color – but I want to do something in that hue. Love it. Guess I’d have to sell it. Hope you will visit me. I have a project up on My Romantic Home as well (a mini Swedish Clock makeover). Love this color from CeCe….Great job! Stopping by from the link up. Cmon over and visit!! 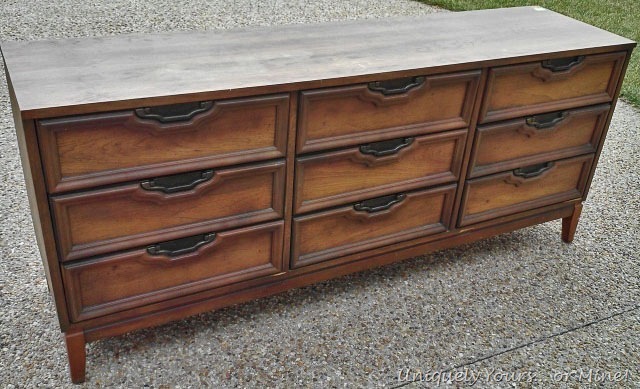 I bumped into your blog yesterday looking for my perfect blue dresser/buffet. You do wonderful work and have so much sense and fun using colors! Thanks so much Estrella! I find it is always nice to bring a punch of color into the home! 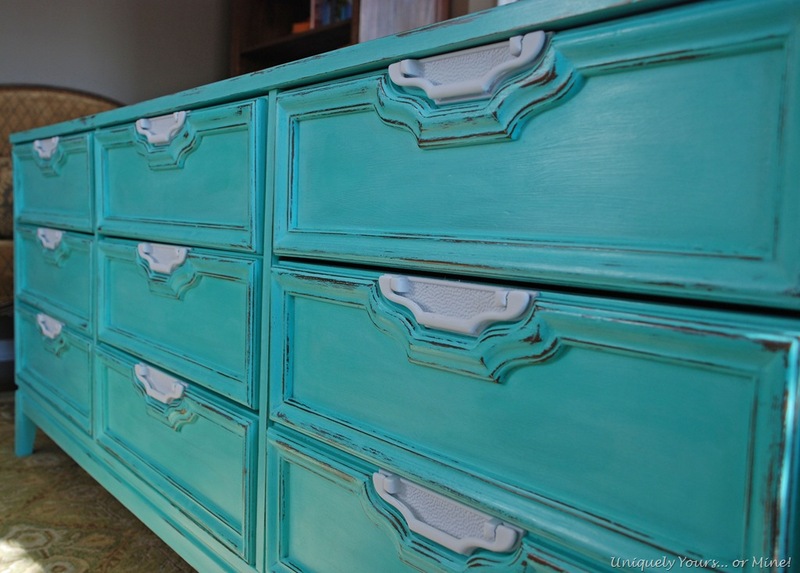 Do you know who the maker of this dresser is? I’m trying to find one for my daughter’s nursery. Thanks!! I think it was a Drexel piece, but I’m not 100% sure.